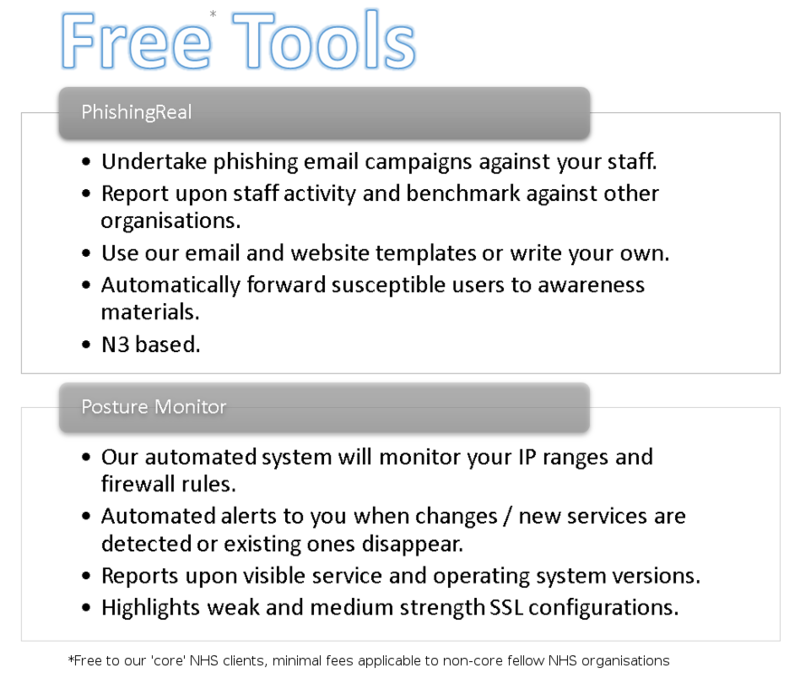 Free of Charge to clients of our core service offerings - This is our inhouse developed phishing email campaign and awareness tool. Subscribers to this self-service web based tool can easily launch phishing email campaigns against their staff. The system records and reports upon subsequent activity such as number of users clicking on links within the emails sent to them and attmpted logins to customisable, pre-made template or custom URLs. Subscribers can opt to use pre-made phishing email templates or create their own rich text emails to send to their staff. As an accredited certifying body for Cyber Essentials Basic and Plus we are able to provide advice and consultancy regarding Cyber Essentials and take you and your organisation through the certification process from start to finish. Having been through the process ourselves (on an annual basis for some years) we are in a unique position to offer advice within the context of the NHS and public sector environments. Prices for the actual Cyber Essentials Basic assessment are £300 + VAT, please contact us if you are interested in our Cyber Essentials related advisory services. Please click here to view our CE service leaflet. Further details regarding Cyber Essentials are available via National Cyber Security Centre, the basic level questions are available for your information here. Having an in-house development function can greatly increase the responsiveness and efficiency of your organisation. Our team can assist during the development process to ensure in-house developed systems do not have an adverse impact upon the ongoing Confidentiality, Integrity and Availability of your systems and data. As an early adopter of Cloud based technology within the public sector we have a great deal of experience in Cloud Computing. If you need advice regarding the deployment of Cloud services we can assist with independent advice via our specialist team. As an accredited Cyber Essentials Certifying Body we are able to walk you through the Cyber Essentials process from initial gap analysis to final certification. 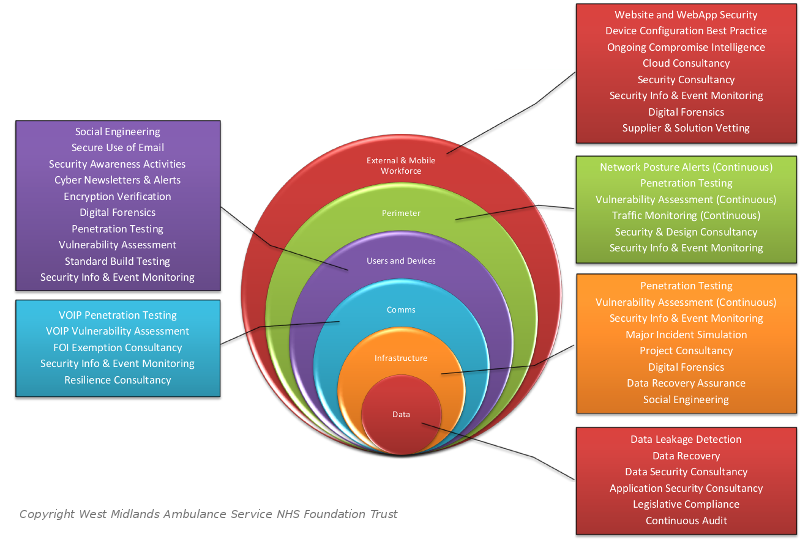 As one of the first NHS organisations to hold the Cyber Essentials Plus certification, our team have extensive experience of the requirements within the context of NHS environments. We use world renowned digital forensics tools to routinely test devices that have undergone 'secure disposal' procedures. This enables us to provide clients with an independent assurance that their disposal processes really are secure. Utilising world renowned digital forensics tools we are able to ensure that devices and media are fully encrypted and aren't going to leak information. We have assisted numerous clients in recovering data from devices when they had believed the data to be lost. The ongoing confidentiality of person identifiable data and information systems is a pivotal component of any organisations security posture. Our specialist team has the knowledge and experience to assist your organization in ensuring your person identifiable data remains secure. The configuration of the devices within your organisation is pivotal in ensuring the ongoing Confidentiality, Integrity and Availability of your data and systems. Our expert cyber security and IT assurance staff can asses your devices (firewalls, PCs, laptops, mobile devices etc) against best practice and formal configuration guidance from internationally recognised sources such as CESG and NIST. Our expert forensics staff are able to undertake digital forensics investigations on virtually any digital device or media utilising world renowned digital forensics tools. From change control procedures and IM&T strategy to highly technical assurance reviews, our team can provide assurances in all IT audit related areas. Our consultants provide fellow NHS organisations with comprehensive advice in relation to legislation they are required to comply with and are sometimes unaware of. Our team of specialists can simulate major IT incidents and then report upon the performance of your staff in terms of their initial response, recovery and resumption of normal business operations. Utilising an in-house developed solution we are able to monitor your outward facing (Internet and NHS N3 network) security posture. Recipients of the service receive near real-time alerts in the event that their network security posture changes. Use our service to stay informed about the security of your network and services. A basic offering from this service is free (no charge) for fellow public sector organisations, more advanced paid for subscriptions start from as low as £50 per month. Click here for more information. Penetration Testing - Networks, Systems, Websites and Webapps etc. Our expert NHS employed penetration testing team hold numerous leading accreditations including TIGER Scheme Senior Tester which is formally recognised by CESG. With unrivalled experience within the NHS trust our team can safely identify weaknesses in your systems before anyone else does. Our plain english reports include recommendations to address every weakness identified. Read more about our penetration testing service here. Our Prince2 accredited staff are utilised by clients to fulfill the role of 'Project Assurance' and also provide independent assurance as to the overall management of projects within NHS trusts. Our team benefit from a large amount of public sector experience and IT knowledge. With a wealth of experience within IT audit, technical assurance and cyber security we are in an ideal position to advise in relation to the security of proposed network and systems design. Utilising an in-house developed solution we are able to undertake social engineering (physical and logical - e.g. email) to ensure your information, staff and office bases are secure. We have achieved numerous high profile security compromises in this area. Our expert cyber security and technical IT assurance staff can assess and critique your standard build images before you deploy them to your estate thereby giving you confidence that newly deployed and imaged systems are secure. Utilising a new supplier or partner organisation is always a risk. Our team can assist in the vetting and assessment of new providers and potential partner organisations in relation to their IT security processes and IT assurance accreditations. With a wealth of experience in both old and new build environments (including PFI projects) we are able to review and critique systems and network designs in relation to resilience and continuity risks. Let us identify any issues before you find out first hand! Our team provide training to fellow public sector organisations in all aspects of IT audit and cyber security from entry level user awareness to ethical hacker training. We frequently find that an organisations weak spot is its staff. Let us raise awareness amongst your staff to ensure they aren't your weakest link. Our vulnerability assessment service can reveal vulnerabilities in your systems, devices and networks without actually attempting to cause a security compromise. Last updated: 22nd June 2017. 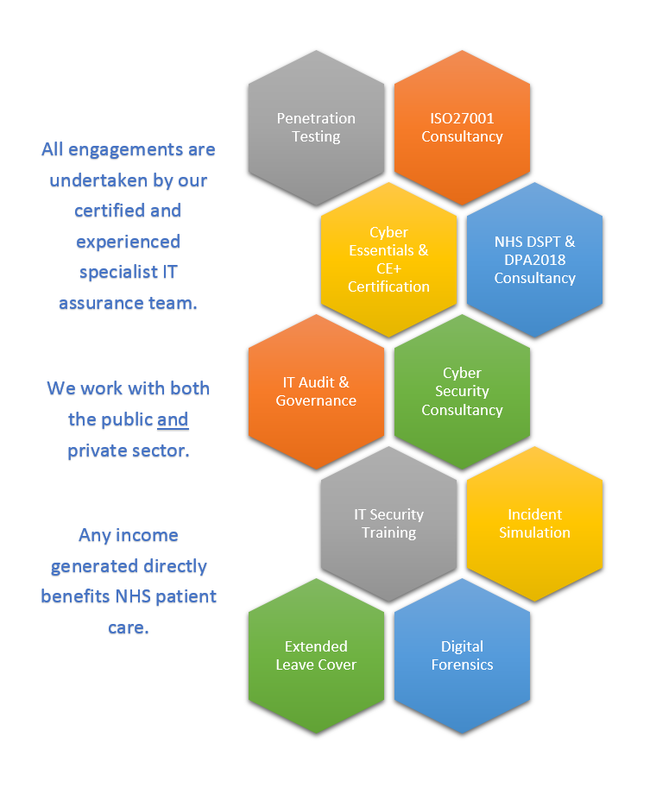 NHS employees providing accredited Cyber and IT Consultancy services (including accredited penetration testing) to fellow NHS, public and private secor organisations.